The Gloversville-Johnstown Joint Wastewater Treatment Facility laboratory is approved by the NYS Department of Health Environmental Laboratory Approval Program (ELAP Lab ID #10085) to perform analysis on non-potable water. The treatment plant laboratory is equipped with several pieces of analytical equipment which allows the staff to monitor the wastewater for various pollutants. Samples of wastewater collected within the plant are analyzed for compliance with SPDES limits, as well as for process control. 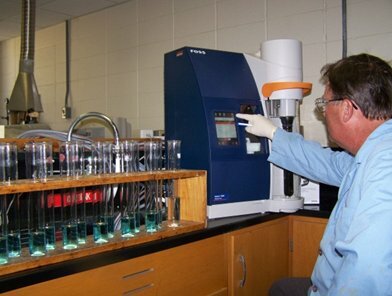 Samples collected from industrial dischargers within the collection system are analyzed in accordance with federal, state, and local pretreatment standards. The laboratory is also responsible for performing Biological Oxygen Demand (BOD), Total Suspended Solids (TSS), and Total Kjeldahl Nitrogen (TKN) tests that are utilized to generate monthly industrial wastewater invoices.